The photograph above shows our former San Luigi Vice-Chancellor for the United States of America, Archbishop Frederick C. King (right) with the late Revd. 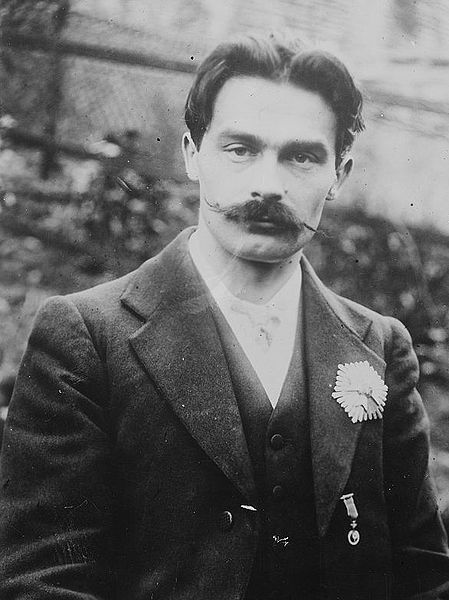 Count Leopold F. Chrzanowski O.P., Grand Master of the Sovereign and Royal Order of Piast, who was a member of the Order of the Crown of Thorns. The occasion of the photograph was a Beaux Arts Ball in aid of blind children held in 1973 by Countess Patte Barham, publisher and editor of “Society West”. Countess Patte had been a member of both the Order of the Crown of Thorns and the Order of the Lion and the Black Cross since 1959. She had purchased the palatial residence of the former Roman Catholic Archbishops of Los Angeles in 1971, and this became the venue for several San Luigi investitures over the years. The Order of Piast was founded on 27 January 1927 as “a progressive Order of Chivalry and Merit”. Its stated purpose is “to protect the absolute independence of the Polish Lithuanian States, and the ultimate recovery of the achievements of the Piast Dynasty; through the realization of a project/movement via ‘The Slavic Commonwealth of Nations.” Count Leopold and other Polish-Lithuanian nobles were responsible for the foundation, with Count Leopold serving as Grand Chancellor following the decease of the Revd. Joseph Paul Chodziewicz. At some point the Royal Stewardship of Poland of Boleslaus the Bold was formed along with the Royal Force of Piast; as of 1963 the Commander-in-Chief of this body was General Conrad Strzelczyk Sphinx, who would receive the accolade of a Duke from Prince-Abbot Edmond I of San Luigi. The first Grand Master of the Order was Prince Pawel Salvator Piast-Riedelski (1884-post 1944), who was a claimant to the throne of Poland. Resident at various points in Great Britain and the United States of America, he had received some financial support in his claims from the British Foreign Office. He published several books setting out his cause, and detailing the history of the Piast dynasty and its Order. 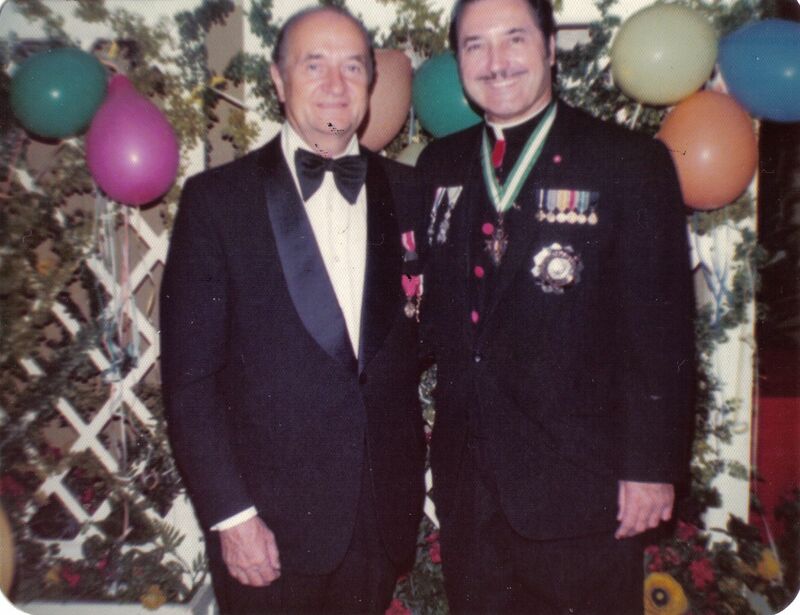 Under Prince-Abbot Edmond I, Prince Pawel accepted an invitation to become a Patron of the Order of the Crown of Thorns. After the death of Prince Pawel, the Order of Piast under his successor Count Leopold came under the administration of the Polish Nobility Association. This organization traced its origins to the Polish uprisings of the 1830s, and from the 1960s was headquartered at Villa Anneslie in Maryland, USA. 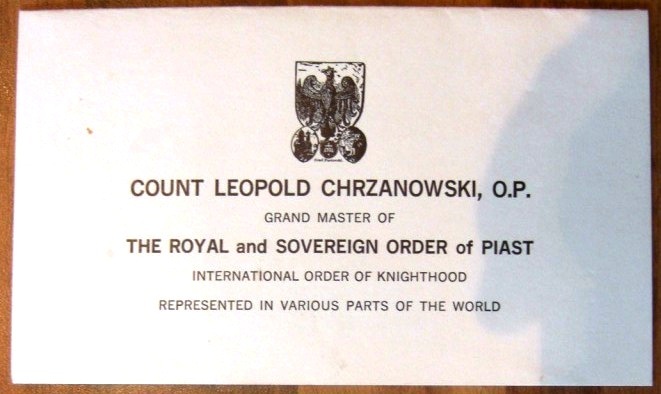 The PNA was charged with the “Stewardship” of the chivalric customs of the Commonwealth of the Kingdom of Poland and the Grand Duchy of Lithuania; and the perpetuation of genealogical and heraldic traditions of the Polish Commonwealth.” It continues to exist today. Count Leopold also honoured San Luigi’s Vice-Chancellor Canon George Tull with the Grand Cross of the Order of Piast. Mgr. 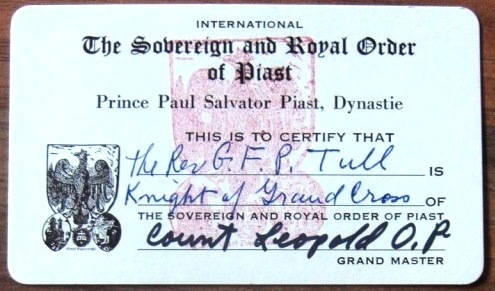 Tull’s membership card in the Order is reproduced below.